With two words, everything changes. Silence is broken and out of the darkness of night and the sadness of mourning comes the gift of a new beginning: The first Easter. Whenever I hear these words, I am filled with hope. With Mary, I have been waiting: I have experienced love and loss; I have acknowledged sin; I have faced the cross. Will I be able to speak this Easter as Mary spoke that first Easter? Will I have the courage to utter my own words of love as I respond to the God who calls me by name? I pray that I might. As I have pondered so many different things this Lent, one of the things that has struck me most is the power of silence. Silence can be good. However, silence can also imprison and disempower. Many LGBT+ people have experienced the disempowerment of silence and of being silenced. Thankfully, many LGBT+ people have also found our voices. We do not speak with the same tone – we are all different – but we have learnt the importance of authentic speech, and we have learnt how to speak well in difficult contexts. The Church in its different denominations needs people who can speak authentic words of love now. The Church is called to serve a fractured world, tired and divided in many ways. In order to serve that world, the Church needs to draw on the skills and the faith and the courage and the humility of all Christians. On this joyful Easter Day, as I stand beside the Easter fire in the fens of Lincolnshire, I will be praying that God’s people will shake off fear, ignorance and prejudice and reach out to each other and to the world in love – and that we will do this whatever our gender identity, sexuality or personal circumstances – relishing in the skills, companionship and difference of all who stand alongside us. with all with whom we live our lives. 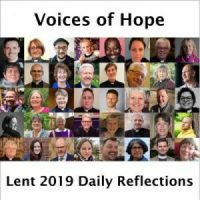 Thank you for taking part in our #VoicesofHope Lent journey – please could you take just a few minutes to give us your feedback on the series? ‘Home’ is such a loaded word for someone from the LBGTI+ community. A sense of belonging is core to the human need for security, safety and loving relationships yet for many ‘family’, ‘home church’, or even ‘community’ are the source of exclusion, malicious gossip, ridicule and even abuse. Even for those for whom a silent tolerance exists, an almost permanent sense of exile persists wherever there is a consciousness that one doesn’t quite fit the mould. For LGBTI+ people of faith, the LGBTI+ community can also seem excluding and a world away from lives of faith, discipleship and service where this, your new community, marvel at your complete devotion to what they perceive as pious patriarchy. More hurtful still, is the injustice that for simply being yourself, your sisters and brothers in Christ believe they have the right to force you into exile from your community of faith, consciously or unconsciously. Some individuals are kicked out, whereas others suffer the drip-drip-drip of being repeatedly made aware that they will simply never be accepted as they are. This leaves a profound wound where the constant shame of outings and exclusions and endless new beginnings deeply bruise the heart, crushing one’s spirit. Sometimes silence is the only way to go on. Yet this wonderful passage from Zephaniah speaks of God gathering ‘us’ all in. The promise is one of an unspoken but deep intimacy; I know your (hidden) shame; I have witnessed your (everyday) oppression; I will gather your (scattered) self from the places to which you have been driven and bring you home. Home, to the One who runs out to greet the long lost child; home to the One who searches high and low for that last lost coin; home to the One who hangs beside the accused and says, “today you will be with me in paradise”. Lord, give us grace to find our home in you wherever we may be, and to find our way home to you, at the last. Micah made himself unpopular with the rich and powerful by calling out injustice and defending the rights of the poor and oppressed. However, he wasn’t a victim and looked forward to a time when the world would exist in peace – a voice of hope then as now. The whole book of Micah rests for me on this verse where Micah highlights what God wants from us (it is so significant that I have it tattooed on my right forearm!). It comes after a series of questions asking whether God really wants all those offerings of bulls, vats of oil and wine or even our first born. The answer is simple, Micah says, God wants us to do justly, love mercy and walk humbly with God. The voice of the Christian LGBT+ community within the church has always been prophetic. For many years we were also perceived as a bit odd, for many, many years we have called out injustice and stood on the side of the oppressed and, praise God, we have seen some movement in the direction of justice – nowhere near enough and that is why the prophetic voice is still needed as much now as ever. For those within and outside of the church we are voices of hope, pointing towards a future where there will be peace and justice. Make no mistake that God is speaking through us as God did through prophets like Micah. Attend any Pride event with the Christians at Pride group and the conversations you have and the gratitude you receive demonstrate that very clearly. But this simple verse applies just as much to us as it does to others. We need to reflect and ensure that as a community and as individuals we are doing that ourselves. Are we seeking justice for all, not just our own cause, and how do we live that out? If we are perceived as acting unjustly in one area of our lives then calling for it in another will have little effect. Do we love mercy? How is this lived out among the LGBT+ community which can be a tough place as well as supportive? How is this lived out in our church communities and perhaps toughest of all, how is that lived out amongst those who disagree with us? How do we walk humbly with our God? As prophets we are not called to be arrogant or aggressive. We are called to be assertive. To have confidence in what we are seeking to do and to achieve because it is God who wants it and calls for it not because it is our idea or gives us a platform. To be true voices of hope our words and actions must do justly, love mercy and walk humbly with our God. Gracious God fill us with your Holy Spirit that we may do justly, love mercy and walk humbly with you our God. I’m a seven new ideas before breakfast sort of person. There are so many good ones to be had: books to be written, projects to be started, groups to be gathered. The problem is, so few of the ideas make it to tea time. I’m quick to lose interest or lose heart. Fortunately, God does not share this trait. God’s good work in me started way before breakfast: it began at the moment God first imagined a funny little creature with her dad’s speckled skin and her mother’s stubborn streak. It’s a work he continued as he whispered his love into my young heart; as he offered me freedom and forgiveness through Jesus; as he breathed new life through dry bones; as he called me to join him in all-consuming adventure. It’s the same work that God has begun in his Church. Here, strangers are knit together as family. Here, freedom and forgiveness are proclaimed by the unlikeliest preachers. Here, purpose and passion spill out of the door. God has surely begun a good work in us. And yet… God’s good work is too often marred. There are so many times when my courage gives way. When my words aren’t enough. When my love dries up. The truth that I cling to is that God will finish the job. God doesn’t lose interest and he will not lose heart. He is faithful in finishing the work he has begun, and so there is always another chance to get it right. I am a masterpiece, as yet unfinished. Here too is my hope for the Church of England, my Church that I love and am preparing to serve. God is not finished with us yet. This is our hope, when our courage gives way. When our words aren’t enough. When our love dries up. There is another chance to get it right. We are Christ’s workmanship, the love of his life, the house he has chosen, the body he dwells in. And we are his masterpiece that will one day be complete. Faithful God, thank you for the good work you’ve started in me and in us. Please give me faith today to trust that you will finish the job. Give me vision to see how you are at work today. Give me the grace to join in, now and always. Fear, uncertainty, brokenness, sorrow. It is something we all carry at times. Even Our Lord sorrowed and wept for His people. And yet we can have a hope and a confidence in Jesus Christ. There is much to sorrow for in today’s world, and as people of the Gospel we are urged to carry the hope of Christ to those suffering and in need. But what about our own pain, and our own brokenness? Sometimes that becomes too much, and we are unable to see beyond it. Our pain may stem from an internal place. Personal brokenness, illness, emotional trauma and mental health issues are things that most of us will experience at one time or another. Our pain may also come from an external place. The pain of ongoing rejection, broken relationships, the suffering of loved ones. The bible tells us that Jesus will take our burden from us, replacing it with an “easy yoke, a lighter burden” (Mt 11:28-30), and yet our brokenness continues, one painful thing is healed only to be replaced with another. In our sorrow we may cry to God asking: ‘Where are you?’ Our brokenness and pain are features of the broken world we inhabit, but it is not permanent. When we meet Christ and choose to follow him in whatever way we are able, God embraces us into God’s family. God began a good work in us. We each began to be transformed into the person God always intended us to be. The work has begun, but it isn’t yet completed. It’s a long job, but not one without a definite end date. On the day of Jesus return, the good work, the transformation which has begun in all of us, and in the world, will be completed. We can be confident of this, that the good work which has begun in us, WILL be completed, our brokenness will be healed, our sorrow gone, our pain released. In my blunt northern way I imagine it like this. we ask you to share the burden of our current sorrow and the pain of our brokenness. and that we can be confident of our transformation on the day of your return. This week marks the fifth anniversary of the death of Jim Cotter, a dear friend and LGCM’s first General Secretary. As a gay man, deeply committed to truth-telling, Jim knew all about exile, about being cast to the edges, but he resolutely refused to become a victim. From that place he lived with such searing authenticity and tenderness, through the AIDS epidemic, from a place of dark depression, of illness and healing. Around 2000 he moved to Wales, near an ancient pilgrim route high in the hills above Harlech, where he welcomed strangers, seekers, poets, pilgrims and friends – few of them from the central powerful places of the church. He exercised a profound and prophetic ministry, incognito. Sometimes, caught up in the machinations of the institution, we can forget the bigger picture. The God of surprises is waiting, incognito, to draw us on, to welcome us, to heal us, to give to us all those things we never dared dream of, even from our place of exile and despair. And that God of surprises has plans for us too. that the locusts have eaten. Give to us the future we thought we should never see. keep us moving on our journey to your city. Amen. 1952: The year of the Great Smog in central London, where my parents had their first home, is vividly remembered by my mother for the terrible air quality. You could not go out because visibility in daytime was down to a couple of feet; you could not open a window or the room would soon be filled with smog. Ambulances could not run; all private and public transport stopped except for the underground. Five days of dense smog killed 4-6,000 people whilst another 100,000 were severely affected by respiratory problems. The government was forced to take decisive action. Eventually. Four years later, the Clean Air Act was passed, but the changes were too slow to prevent another smog ten years later. Fortunately my parents took the decision to move out of London to a more healthy environment. The deadly impact of the Great Smog was immediate and very dramatic. More insidious but no less dramatic, is the toxic spiritual smog in our country today. This is profoundly unsettling. National turmoil created by Brexit has been the catalyst to spawning deep divisions in our society. News reports full of endless speculation and polemic do nothing to help matters. This has resulted in profound disillusionment and frustration for very many people. In stark contrast, disciples of Jesus Christ who seek to follow his teachings, have an eternal perspective not confined to this life with its many disappointments and traumas. Instead we place our confidence in God’s goodness and eternal sovereignty. But to benefit from this knowledge we must have an unambiguous strategy – to guard our hearts from the toxic effects of our national attitude of cynicism and hostility. In his letter to the Philippians, St Paul gives a clear strategy to eschew this kind of scepticism and negativity. Throughout Scripture we are instructed to “Rejoice in the Lord always”; to rise above our national malaise and live in hope now and for the future. Striving to make strategic changes to the situation, however much relief that might bring temporarily, is no solution. Authentic change begins with the heart! Rarely do we see the need for change in our own heart attitude – the very essence of repentance – until we’ve exhausted all our own schemes and the mounting crises all around us become so overwhelming that we are forced to stop in our tracks. Then we might begin to see the things that are good, true, noble, right, pure, lovely and admirable. These excellent, praiseworthy qualities can be seen everywhere in God’s world when our eyes are open. To “think on these things” provides the oxygen we need for our souls. The Great Spiritual Smog begins to clear as we open our mouths to share the divine perspective. The decision to live with a clean heart and wholesome outlook is ours; nobody else can make that for us. It is the outworking of a pilgrim’s resolve to follow Jesus Christ – the Lord of all. And it is the way of peace. Thanks be to God for the gift of life and and breath in us; for those good relationships that we have and the abundance of opportunity every day to love and encourage others, and thereby make the love of God known to all.